The RxPense® Hub securely dispenses a complete dose of medications, to the right patient, at the right time. The RxPense® Portal securely bridges RxPense® Hub with Caregiver, Patient, Physician and Pharmacist. Why is the RxPense® the best automatic pill dispenser for seniors? It has the best feature set, the best security, the best communications, the best notifications, the best medication formats, the best medication loading process, the best audit trail and dispensing history, the best vitals collection, the best medical profile, the best emergency support, the best telemedicine and the best monitoring. Medipense is passionate about developing products and services to support seniors, chronic care patients and those with increased medication regimens. 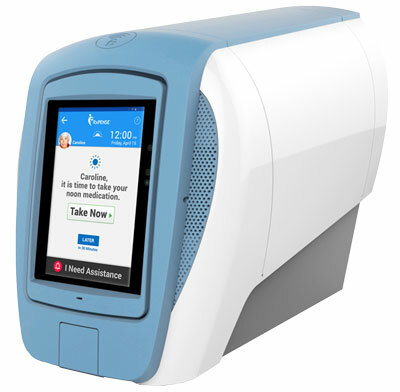 Regardless of home location or language, patients will benefit from the RxPense® automated pill dispensing, remote patient monitoring, increased medication adherence and telemedicine. Our product line is named and trademarked RxPense®. With an RxPense®, the senior, patient or consumer can access and communicate visually and verbally with a physician, receive notifications, alerts and medications at the right time. The RxPense® can integrate with other commonly available health devices and display health and medication data in one consolidated portal. Should an adverse event occur, such as a missed dose, caregivers are notified. Without leaving the home, your physician can access your vitals, medical and medication history and order new medications to be delivered. Hospitals and Payors realize better patient outcomes out of the Hospital, in a home environment. Did I mention that the RxPense® is the best, easiest to use, most secure, connected, multilingual pill dispenser? Designed specifically for seniors of all ages and mobility, the RxPense® automatically dispenses the pills. The RxPense® Portal, securely stores all the data and makes this available only to authorized users. The RxPense® API bridges the device with cloud. I almost forgot, Yes, the RxPense® can listen and talk! When it is time to take your pills, the RxPense® will alert you via voice, music, alarms or other supported notification method. With advanced Voice Biometrics, the RxPense® can authenticate your voice, and only your voice, to ensure you are the authorized user. Repeat a simple phrase, as displayed on the screen, and your voice is your password to successfully gain access. The RxPense® and five rights of medication administration, AKA the 5 R’s. How do you ensure 100 patients receive their medications at the right time or the same time? The RxPense® does. How do you know when a patient has not taken their medications on time? The RxPense® notifies. By alleviating stress on caregivers and assisting healthcare providers in fulfilling an error-free mandate we are effectively reducing the 5 R’s into 1 R, the RxPense®. Learn More. The RxPense®provides better data to those who can make the right decisions. Remaining at home longer, staying independent, being self-sufficient is important to our aging society. Rather than trying to contend with and manage a buffet of medications in vials and plastic containers, the RxPense® locks up, securely, stores and dispenses medications when it is time. It can notify and record all events, even connect to your existing fitness or health sensors (only with your permission of course). When a family member feels ill, a personalized telemedicine or direct, secure video session may be launched with their physician who may diagnose, order tests and medications as a result. The medications, when delivered by your pharmacist, can easily be loaded into the RxPense® Hub. A caregiver or physician can follow-up with the patient by logging into their secure, cloud-based web portal, reading the data, making decisions, activating video or voice contact and making it easy for a senior to remain at home. With an RxPense® at a Residence or Clinic, the senior or patient can communicate with caregivers and receive the right medications at the right time. A nurse or caregiver can monitor the patient, 24×7 and receive alerts to avert poor outcomes. Administrators have a full audit trail and record of medication adherence along with patient vitals on which to base their decisions. Better data, more timely data, helps better outcomes. It’s the best pill dispenser for seniors! Hey mom, it’s time to take your pills!